Get 4% p.a. interest with DBS Be Your Own Boss (BYOB)! Looking for a savings account that doesn’t require you to jump through too many hoops for higher interest? If you struggle to meet the $500 monthly spend requirement on your credit card, there’s a new product on the market that you might want to consider. 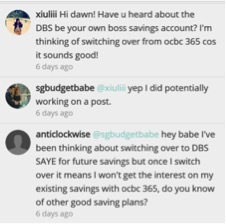 A few readers recently alerted me to DBS’ newest promotion – the Be Your Own Boss (BYOB) savings initiative – and asked me what I thought about it. 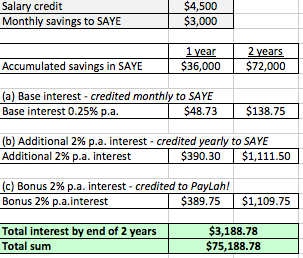 Nothing gets my attention like another high-yield saving account, so I reached out to DBS and dug out more information. Here’s my take! The premise is quite simple: DBS BYOB encourages you to pay yourself first when you get your paycheck each month. This is pretty much in line with what I’ve been preaching since my very first post in 2014 (read: how I saved $20,000 in a year), so it gets a thumbs up from Budget Babe. DBS calls this method akin to saving like a boss. At 4% per annum, that’s a pretty solid interest rate, and one that currently beats all the other high-yield saving accounts I’ve previously reviewed. What I used to do, before anything like BYOB was available, was to open up separate bank accounts for my savings and expenses. My paycheck went directly into my savings account, and I would manually transfer a fixed sum to serve as my “pocket money” for the month into my expenses account. For those of you who are lazy to track your daily expenses, this is a effortless way to stay disciplined and within a budget. DBS makes it easier for you by automating this step. Set a figure sum to be automatically transferred to your POSB Save As Your Earn (SAYE) account every month and try to resist the temptation to withdraw money from your SAYE account. Next, use your DBS / POSB Credit or Debit card to make at least 5 transactions monthly. Unlike many of the other saving accounts which require you to spend at least $500 on your credit card in order to earn bonus interest, there’s no such requirement here as you could technically make as little as 5 x $1 transactions just to qualify! Need some ideas? this would be the best account in the market with the highest interest rates. 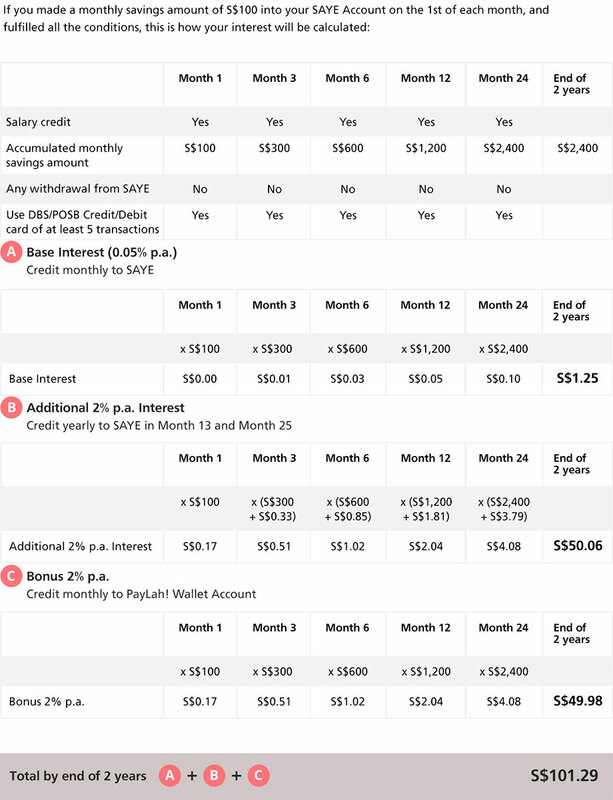 I’ve compared against the other high-yielding savings accounts in Singapore and none offers such a high interest rate with such low requirements at the moment. If you know of any better deal, please jio me! View POSB SAYE base interest rates here. Tip: Deposit >$800 monthly to qualify for the highest tier. Register for the Be Your Own Boss initiative here. a. Get $88 cash gift if you do this before 30 September! 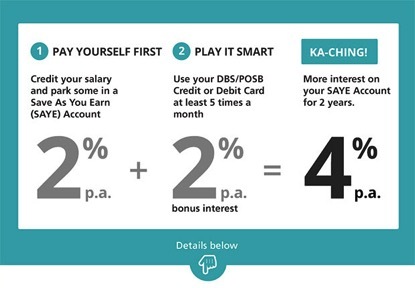 GIRO credit your monthly salary into a DBS/POSB savings account. Open your SAYE account online here, and select the salary crediting account as the debit account to automate your monthly savings amount between $50 – $3,000. a. Choose your preferred date for the transfer between the 1st – 25th day of your salary credit. Leave your SAYE account untouched. 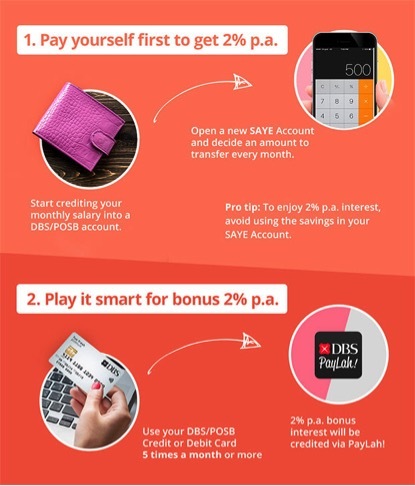 Use your DBS/POSB Credit or Debit card on at least 5 transactions a month. a. For the best debit card, I recommend the DBS Visa Debit Card which gives you 5% cashback on your Visa payWave purchases (min. 5 transactions a month). b. You can use your card for Grab / Uber rides, or grocery shopping, or at the movies, or offer to pay the bill first when you’re eating out with your friends. Remember to get this done before 31 September 2017 to enjoy the bonus cash gift! Before you sign up, you might also want to read about the BYOB promo, its terms and conditions (I’ve highlighted the more pertinent ones in this post), the bonus interest illustration and the SAYE account. Disclaimer: This article is written in collaboration with DBS (after a reader alerted me to BYOB, which was how I came to know about the product). All opinions are of my own.